In closely fought elections, where every vote is expected to matter, Dalit votes could play a decisive role in 28-30 constituencies in the 230-member assembly. Sanjeeb Mukherjee and Ramveer Singh Gurjar report. For 25-year-old Ankit Solanki, a Dalit, a vote for the Bharatiya Janata Party would mean betraying his community, many of which have resolved not to vote for the party this time, more so after six of them were killed in police firing in the region last year. Sitting under a tree along with some of his community members outside Gwalior city, Solanki points to the vast tract of land where homes have been demolished because those were illegal encroachments on government land. "We have been staying in this place for so many years, how come suddenly this place became illegal," Solanki says, rubbishing government claims. Though not a big fan of the ruling BJP as he has seldom voted for the party earlier, Solanki says this time around their anger is more palpable. Dalit votes have become crucial because of their perceived disenchantment with the MP government following the Mandsaur firing incident. In the 2013 assembly elections, the BSP won four seats. Dalit votes in Madhya Pradesh are largely concentrated in the Gwalior-Chambal region and Vidhya Pradesh. "Dalits of Bhind, Morena and Gwalior have traditionally been supporters of the Congress and in between they oscillated between the BSP (Bahujan Samaj Party) and Congress but after the firing on some protesters on April 2, their choice seems to have crystallised," said Jayant Tomar, social and political expert and head of journalism in a local college. In closely fought elections, where every vote is expected to matter, Dalit votes could play a decisive role in 28-30 constituencies in the 230-member assembly. In all these assembly constituencies there are 12-16 per cent Dalit votes, according to the Centre for the Study of Developing Societies (CSDS). For example, in the Gwalior seat, the BSP polled 15,000-16,000 votes in the 2013 elections, but this time the party hasn’t fielded a candidate and whoever this electorate votes for would win. Traditionally, the BSP hasn't been a very big force in Madhya Pradesh as a whole and its support base has been concentrated in a few pockets of the Chambal and Vidhya Pradesh regions, comprising districts such as Gwalior, Morena, Bhind, Rewa and Satna. Castes such as Kori, Khatik, Julaha, Teli, Baghel and Khuswaha are in big numbers in these parts. In the Chambal region, according to the CSDS, the BSP got 13.7 per cent of the votes in 2003. That rose to 20.4 in 2008 and then dropped to 15.6 per cent in 2013, while in the Vindhya Pradesh region, its vote share remained 14.3 per cent, 14.7 per cent and 12.0 per cent in these elections, respectively. In the current assembly, the BSP has four legislators, two each in the Gwalior-Chambal division and two in the Rewa-Satna regions. The BSP's vote share never crossed 10 per cent in the last three Madhya Pradesh elections and a tie-up with the Congress would have helped in transferring this entire vote to the national party. "I don’t believe 100 per cent votes get transferred in any elections, but in the case of the BSP, almost 80 per cent of its votes are transferable," Sanjay Kumar, director, CSDS, said. He said by not entering into a tie-up with the BSP, the Congress might have lost a trick which could play a decisive role in a tight scenario. 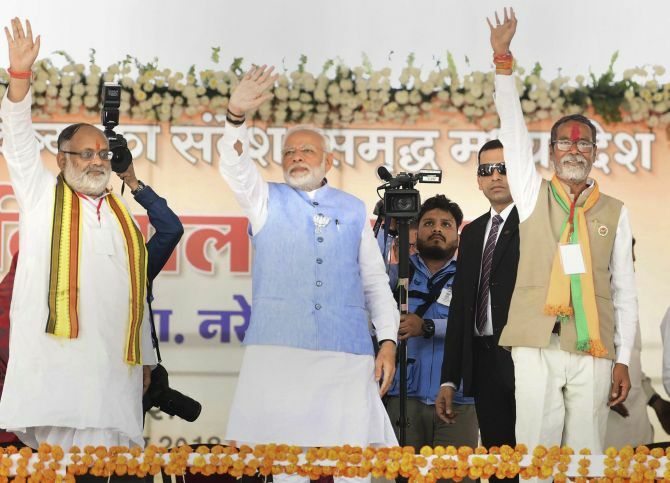 In constituencies such as Gwalior Rural, the presence of BSP candidates has made the contest triangular, which, anyway, could have been bipolar in the absence a reliable third force. However, for someone like Deepak Jatav, if push comes to shove, his community members might even consider someone other than the BSP and the party more likely to form the next government. "Many people say that Indian voters don’t like to waste their votes and more often tend to vote for the winning candidate, but if that was so, all these smaller regional parties would not have polled any votes in elections. "These smaller parties do have their own dedicated vote banks," Sanjay Kumar said.